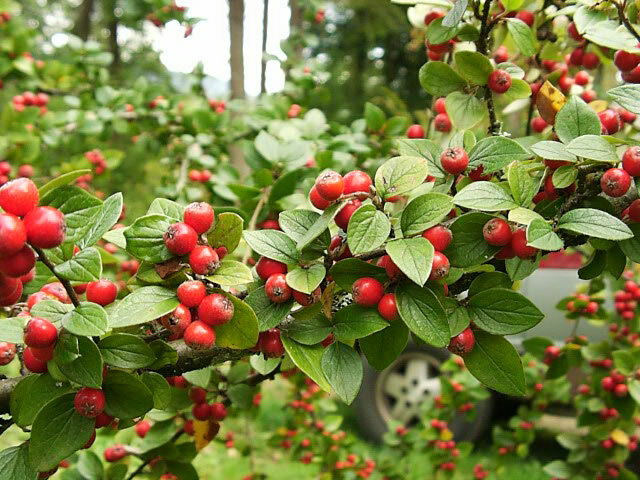 Cotoneaster is an extremely diverse genus of attractive landscape plants that include creeping ground covers, dwarf sized bushes and tall sprawling shrubs. These deer resistant plants typically have small, pink or white flowers that resemble tiny, opening rose buds and attract Hummingbirds and Bees in the spring and early summer. The flowers are followed by bright red or orange berries which feed the Birds in the fall and winter. There are about 200 different species of Cotoneaster. Most grow best in full sun, but several species will thrive in partial shade as well. They prefer moderately fertile, well-drained soil, but are adaptable to almost any type of soil from sandy to clay, as long as it is not remain too wet. after which they are fairly drought tolerant plants. Apply a generous top-dressing of compost in the fall. Cotoneasters are succeptible to attacts from aphids and scale insects. which can cause fireblight fungus if left on the plant over winter. and those that upset the symmetry of the plant if needed. Low growing shrubs can be cleaned up by removing some of the oldest branches in early spring. Medium and tall growing varieties look best when they are left un-pruned to maintain their natural, fountain-like shape, especially when they are grown as single specimens. If it becomes necessary to prune these Cotoneasters, pruning should be done to enhance the natural form, rather than to try to re-shape it. You can trim the longer shoots right after flowering, but any major pruning should be put off until February. Cotoneasters can be propagated with softwood cuttings taken in early summer. The use of a rooting hormone is highly recommended. Low growing species can be propagated by simple layering in the fall. Pin a low growing stem to the ground, using a piece of stiff wire bent into a U, leaving the last 6 to 12 inches of the stem exposed. Cover the pinned area with soil, then bend the tip sharply into a vertical position (for upright plants) and nick the bark on the underside of the bend. Provide a stake to hold it in place. Once the layer is well rooted, it can be severed from the parent and moved to another part of the garden. Birds are by far the biggest propagator of Cotoneasters as they spread the seeds of the berries they've eaten. When the berries become soft and mushy, the birds will no longer eat them and they eventually fall to the ground where they germinate. These seedlings can be transplanted very easily up until they have grown a foot tall. Ripe seeds can be sown directly in the garden in the fall. for erosion control on sloping ground or trailing over retaining walls. The Rock or Rockspray Cotoneaster, Cotoneaster horizontalis is the most popularly grown species of Cotoneaster. They are spreading, deciduous plants that only grow to 2-3 feet tall, but will spread up to 8 feet. This Cotoneaster has a layered, flat branching habit, with small glossy green leaves layed out in a distinctive herringbone pattern. The foliage turns reddish-purple in the fall before dropping in mid-winter. Can be espaliered against a fence or wall for a dramatic accent. Hardy in USDA zones 5-7. Creeping Cotoneasters, Cotoneaster adpressus are deciduous, mounding plants that only grow 12"-18" tall, but will spread up to 6 feet. The shiny green leaves have wavy margins and turn to a maroon red in the fall. Produces a profusion of bright red, ½" fruit in the fall. They will tolerate partial shade, can be grown in a wide range of soil pH, and are unaffected by sea spray. Cranberry Cotoneasters, Cotoneaster apiculatus are low growing, deciduous shrubs that grow 2-3 feet tall and slowly spread to 8 feet. They form dense mounds of glossy, dark green foliage that turns reddish-purple in the fall, and produce single, bright red berries all along the stem that last throughout the winter. Will tolerate some shade. The Queen of Carpets, Cotoneaster procumbens is a flat growing, ground hugging, evergreen ground cover plant that only grows 4"-6" tall but spreads up to 6 feet. It has small, round, dark blue-green foliage and white flowers in early summer. Bearberry Cotoneasters, Cotoneaster dammeri creep along the ground as their stems root in place to create a nice evergreen mat of 3"-12" tall, glossy, bright green, deeply veined, rounded foliage that can spread up to 10 feet. They have solitary white flowers that bloom throughout the summer and produce bright red berries in the fall. Many hybrid forms are available. Will tolerate partial shade. Most of these tall shrubs or trees have the evergreen leaves that turn color in the fall, small flowers and brightly colored fall berries. They are easily maintained by careful pruning to create excellent hedge plantings. 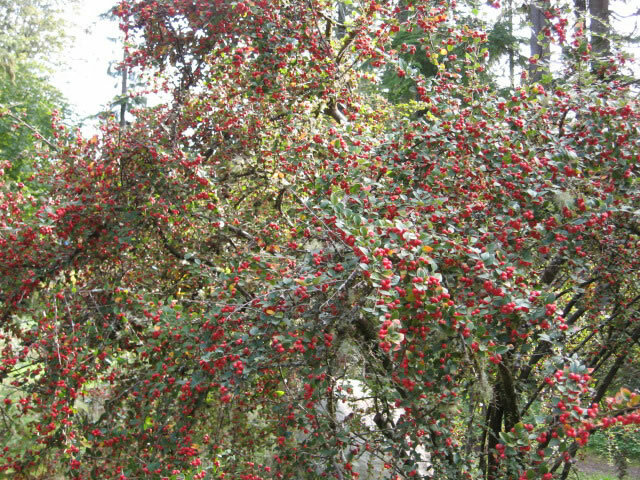 Spreading Cotoneasters, Cotoneaster divaricatus are erect, deciduous, rounded shrubs that grow 5-6 feet tall and up to 12 feet wide. Their glossy, 1" leaves are very dark green and turn orange and red in the fall. The pinkish white flowers that appear in late spring and summer form bright red, ½" egg-shaped fruit in the fall. 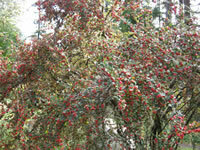 Spreading Cotoneasters tolerate partial shade and thrive in moist, acidic soil. Hardy in zones 5-8. The Willowleaf Cotoneaster, Cotoneaster salicifolius is an evergreen, spreading shrub with an arching growth habit. The species grows up to 15 feet tall, but there are several hybrid varieties that are lower growing, 3-4 foot shrubs. Their narrow, willow-like foliage is dark, glossy green in the summer, turning to a reddish-purple or bronze in the winter. They produce clusters of small white flowers that form bright red berries in the fall, which last well into the winter and create a nice contrast to the foliage. Zones 5-9. Franchet's Cotoneaster, Cotoneaster franchetii is an arching, evergreen shrub that grows up to 6-8 feet tall and wide.